Amazon.com offers the Sony HandyCam HDR-SR5 40GB HD DV Camcorder (pictured) for $699.99. With free shipping, it’s the lowest total price we’ve ever seen by $28. 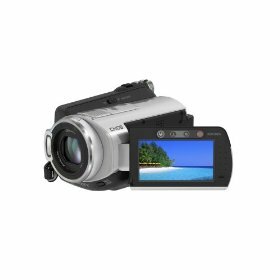 Features include a 40GB hard drive, Carl Zeiss Vario-Sonnar T* lens with 10x optical zoom, 1080i recording, 2.7" widescreen LCD, 2.1-megapixel still images, Memory Stick PRO Duo slot, USB connectivity, and more. It lists for $1000. If you want to take the next step up from Sony and get 1080P recording, hit the Sony HDR-SR7 AVCHD 6.1MP 60GB High Definition Hard Disk Drive Camcorder with 10x Optical Zoom which is $999. It is $400 off of list.